We are glad to introduce new step-by-step tutorial on creating WordPress theme based on Cherry Framework. If I unzip the cherry-theme-master.zip and then upload a zipped copy of the themeXXXX folder I get the error “The parent theme could not be found. 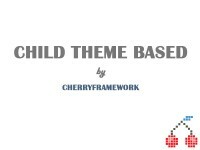 You will need to install the parent theme, CherryFramework, before you can use this child theme”. I already have the CherryFramework installed. Please contact our support team at [email protected]. They will check your theme and provide with further assistance. Hi, the intro seems deceptively simple, but then the child theme installation instructions are clearly broken and poorly documented. Also, your replies to user questions here is anything but helpful. I thought Cherry Framework was a possible candidate for our project, but the online docs are very unhelpful when followed to the letter, and return lines and lines of error codes… with sporadic and cryptic responses from your “support team”. We regret that our product doesn’t meet your expectations. Please specify what exact issues do you have. We’ll do our best to help you. If you are still interested in our solutions, very soon we are planning to release a new version of our framework, Cherry Framework 4, with new features and updates.